A spiced Mexican chocolate organic rooibos is paired with a single-origin Valrhona milk chocolate from Peru to create ¡Mexican Fiesta! This year, when you bring mom her breakfast in bed (or wherever she prefers to have it served) set the tray with a special collection of tea-infused chocolates. The collection includes five offerings made by Newton-based Emmy Award-winning children’s media producer-turned-chocolatier Beth Kirsch, of Beth’s Chocolate, who worked in collaboration with Tea Hive’s Rebecca Sgouros, of Brookline. An archeologist who has traveled the world and “collected tea leaves wherever I traveled,” Sgouros founded Tea Hive, a subscription-based company that offers teas and related products, in 2017. 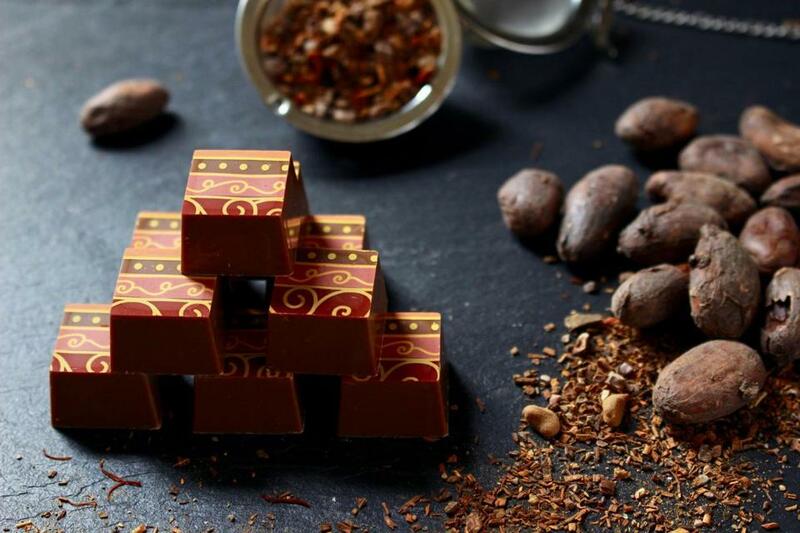 The women’s first collaboration, included in the collection, was a chai-infused chocolate that Kirsch developed for Tea Hive’s “Chai Society” box. She infused cream with a blend of chai spices and let it sit overnight, giving “all the flavors a chance to reveal themselves,” she explains. The resulting bon bon, Masala Chai, was so popular that the women wanted to collaborate again. “We thought Mother’s Day would be a good opportunity,” says Kirsch. Rounding out the collection, which Kirsch says “is intended to be international,” are a matcha white chocolate, combining high-grade ceremonial Japanese green matcha and organic white chocolate; pomegranate, with white Chinese pomegranate tea, Lebanese pomegranate molasses, and dark chocolate; and jasmine, with floral jasmine tea and dark chocolate. Sgouros will add any teas to the chocolate collection to make a complete gift box. She recommends the springtime Garden Party or Chai Box and is also happy to advise gift givers on customizing their selections. Order online at bethschocolate.com or call to arrange pickup; or myteahive.com or call to arrange delivery.